Home > Law Books > Practice Materials > O'Connor's Texas Causes of Action Pleadings, 2019 ed. 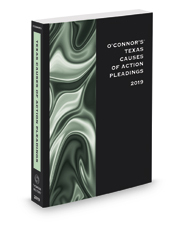 O'Connor's Texas Causes of Action Pleadings, 2019 ed. O'Connor's Texas Causes of Action Pleadings contains many different types of forms – general pleadings, notice letters and other prelitigation forms, petitions and answers for every cause of action in O'Connor's Texas Causes of Action, and specific language for alleging participatory and vicarious liability, damages and other compensation, and defenses. The forms are organized and numbered to match the corresponding chapters of the O'Connor's Texas Causes of Action, making it easy to use the books together.